After Speed Week was cancelled due to heavy rains and flooding in 2014* and 2015 we finally got back to the salt this past August 2016. 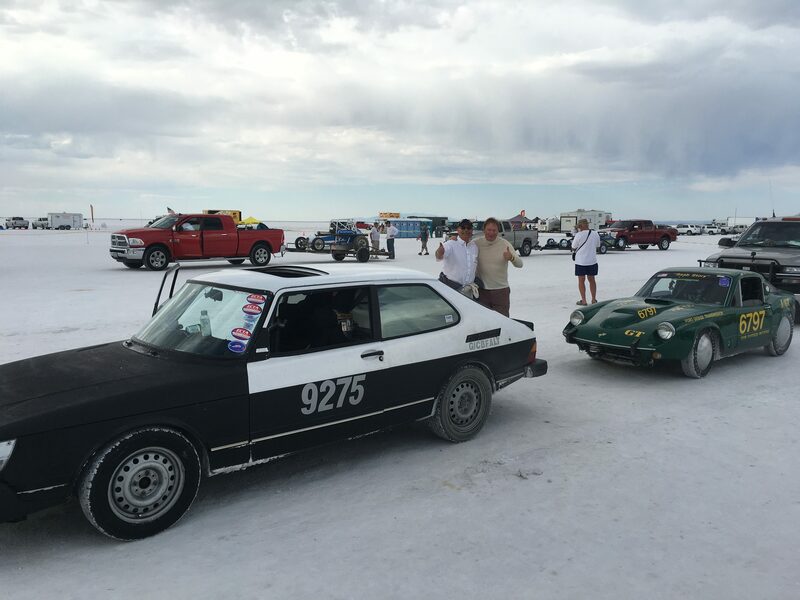 We were fortunate enough to have the SOC16 (Saab Owners Convention) a week before Bonneville this year. Usually the dates collide and I choose the salt as a year of prep can not go to waste. This allowed me to attend SOC16 in Atlanta and a great track day with one of three cars to run at Talladega Speedway back in 1987. In 1987 Saab set 21 world and international speed records at Talladega with Saab’s world famous LONG RUN RECORDS. As many in the Saab community know, I was asked to bring my #3 car (1987 Saab 9000) back to Talladega to run. This was almost an impossible event to miss for me, so that said we did the killer trip to Atlanta and then raced back to Iowa to grab my truck and trailer and head to Utah! Going to SOC is always a great event and should be a “must do” for Saab lovers. Seeing old friends and making new ones keeps SOC’s a fun event. Many well wishers at SOC were seen and heard. Leaving for Iowa after SOC was a speedy trip home only to gear up for round TWO…a date at the salt. To explain how hard it is to prep and run a car at Bonneville, read about the work of Dan Haugh of Kansas and his 1987 Saab Classic 900 at the salt. The salt can be a grueling event with heat into the high 90’s and long hours at the “brightest place on earth”….the hot sunny salt flats. Dan set a new record of 140.857 MPH (Down run of 139.620 & Record run of 142.095 MPH) with his turbo powered 2.0L car and explains in his articles in NINES about the stress of attempting to do all this at Bonneville. Dan is busy making modifications for 2017 already. Dan had also ran at the Ohio Miles and has records there with his classic Saab too. We started running as planned on Saturday morning the 18th as planned. I was the driver and glad for it as the salt was less than perfect. We ran fast but not quiet fast enough. There were a mirage of small issues limiting our success the first 3 runs. 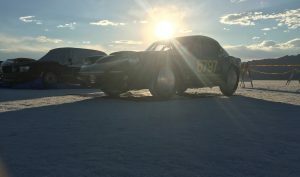 We had starter issues twice, once at the starting line, an electric water pump failure, our brakes completely failed (only use rear), and finally a rough track that kept us bouncing all over the course. Even though we had good runs only 3/10’s and 7/10’s of a second off our old record of 121.203 MPH we just could not get above 122 MPH. Once we sorted all these issues out on our forth run we finally hit our goal with an average mile speed (set from mile 2 to 3) of 122.295 MPH and qualified to have another chance at a record run!. 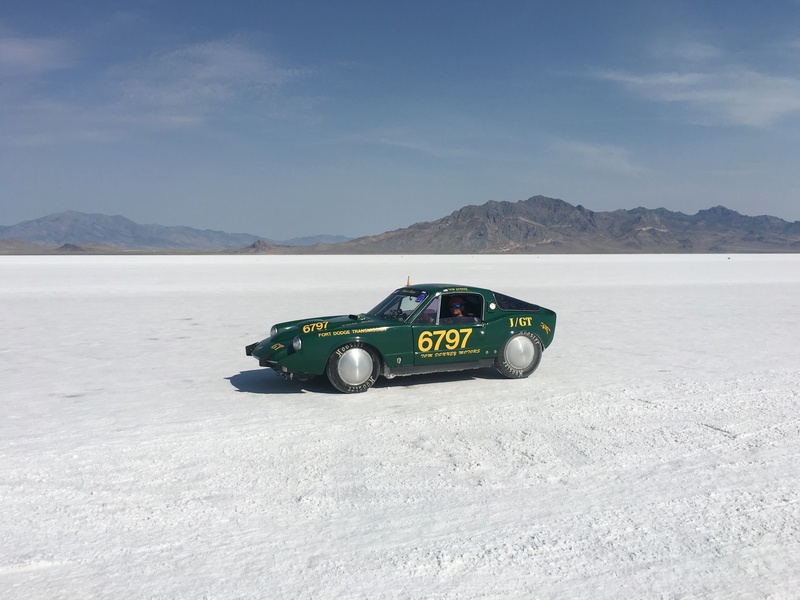 On our fifth run the next morning we were able to attain a NEW Bonneville Land Speed record of 123.075 MPH (with our 750cc engine. To date this is the fastest average mile we have ran with a return speed of 123.855 MPH (199.325 Km/h) Top (terminal) speed was actually over 124 MPH). After resetting our record it was time to change drivers (great news for my back) to Steve Myers of Skunk River Restorations in Ames, Iowa. Steve races nearly every weekend somewhere and was an exciting and experienced last minute add to our team when my service manager at the shop took ill and and had to cancel a week before leaving. My wife Patti, was very relieved when she heard Steve had agreed to go as it got off the hook as an emergency “back-up” crew member. 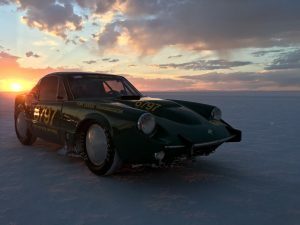 With a new driver in place it was time to continue to crawl our way up the speed ladder with a vintage our Saab Sonett two stroke. As it turned out the salt Gods we not with us the last few days. My crew chief, Steve Myers, got his rookie training done and first runs out of the way. Waiting in line for his second real run we started to notice the wind was changing and had a chance for a tailwind. (Which would have aided in exceeded my newly set record). However as luck would have it, at 4pm, when we were only two cars from running, (after a 4 hour waiting) racing was postponed due to heavy Crosswinds that had now came up. Then at 6 PM they canceled racing for the day. (Which ultimately cost us a new record.) The next day Steve DID exceeded my new record with a down run of 123.397 MPH which sends you to impound till the next morning for a “back Up” return/record run attempt. But the return/record (back up) run the following morning was not to be. A weather system change arrived and we had to run into an 11 MPH headwind, and we simply could not get the Sonett back into record territory. That cancellation of racing we had two days earlier put us into the headwind days and cost us the new record. We ran a few more times that day but the headwind was too great and the forecast for Thursday afternoon and Friday was the same, lots of headwind. 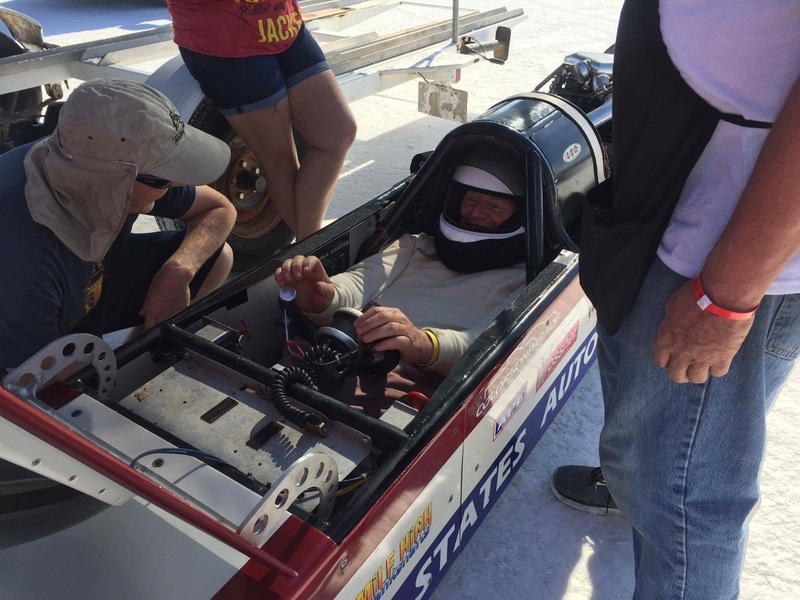 So we loaded up and left with only one new record of 123.075 MPH. We had hoped for more, but obviously we are always happy ANYTIME we can set a new land speed record at the Bonneville Salt Flats. As the final records for the week long event came in, turns out the weather and salt produced the LOWEST number of records being set in modern memory. 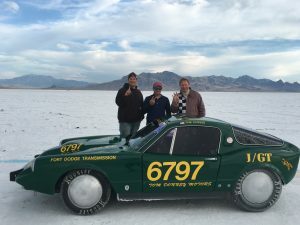 But this year did include getting to see Danny Thompson FINALLY set a land speed record at Bonneville @406.767 MPH (655km/h). 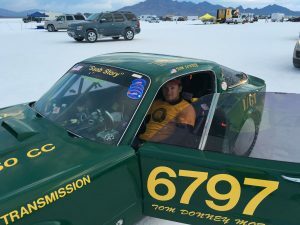 He is the son of the late Micky Thompson and drove his dads 1968 twin engine Challenger II into Bonneville history books. 2010 in a Saab Sonett powered by a 750cc two stroke engine! 2nd. “…121 MPH is all I can do” ……..
1st 3 runs of 2016…All good fun in an old Saab. (ran by the Southern California Timing Association) was cancelled for rain. Both groups honor each others records.